Summary: Researchers have been able to successfully decode and predict the brain activity patters of word meanings within a sentence. Researchers at the University of Rochester have, for the first time, decoded and predicted the brain activity patterns of word meanings within sentences, and successfully predicted what the brain patterns would be for new sentences. The study used functional magnetic resonance imaging (fMRI) to measure human brain activation. “Using fMRI data, we wanted to know if given a whole sentence, can we filter out what the brain’s representation of a word is–that is to say, can we break the sentence apart into its word components, then take the components and predict what they would look like in a new sentence,” said Andrew Anderson, a research fellow who led the study as a member of the lab of Rajeev Raizada, assistant professor of brain and cognitive sciences at Rochester. “We found that we can predict brain activity patterns–not perfectly [on average 70% correct], but significantly better than chance,” said Anderson, The study is published in the journal Cerebral Cortex. Brain activation patterns for different sensory and emotional aspects of the word ‘play.’ The numbers to the left of each brain pattern show how strongly the word is associate with each feature. For example, ‘play’ is positively associated with ‘Biomotion’, because playing often involves people moving their bodies. But it is negatively associated with ‘Unpleasant’, because play is rarely an unpleasant activity.’ Credit: Andrew Anderson/University of Rochester. To predict the patterns of particular words within sentences, the researchers used a broad set of sentences, with many words shared between them. For example: “The green car crossed the bridge,” “The magazine was in the car,” and “The accident damaged the yellow car.” fMRI data was collected from 14 participants as they silently read 240 sentences. “We estimate the representation of a word ‘car,’ in this case, by taking the neural activity pattern associated with all of the sentences which that word occurred in and we decomposed sentence level brain activity patterns to build an estimate of the representation of the word,” explained Anderson. What does the meaning of a word look like? The new semantic model employs 65 attributes–such as “color,” “pleasant,” “loud,” and “time.” Participants in the survey rated, on a scale of 0-6, the degree to which a given root concept was associate with a particular experience. For example, “To what degree do you think of ‘coffee’ as having a characteristic or defining temperature?” In total, 242 unique words were rated with each of the 65 attributes. “The strength of association of each word and its attributes allowed us to estimate how its meanings would be represented across the brain using fMRI,” said Raizada. 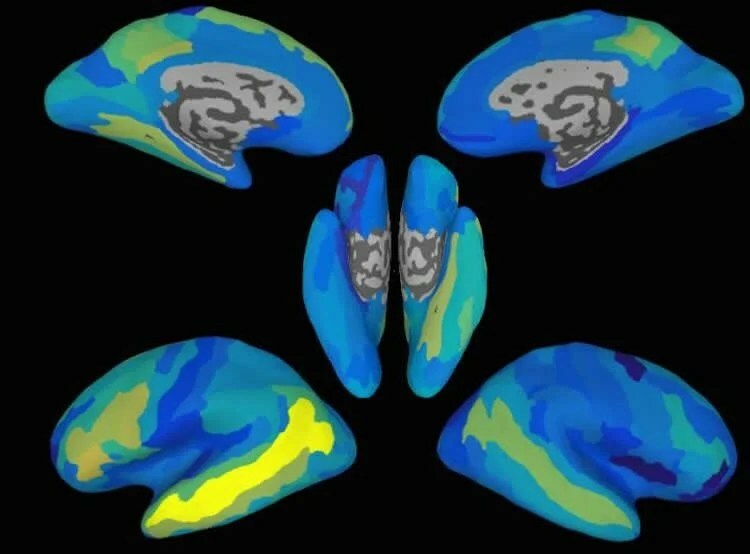 These brain maps show how accurately it was possible to predict neural activation patterns for new, previously unseen sentences, in different regions of the brain. The brighter the area, the higher the accuracy. The most accurate area, which can be seen as the bright yellow strip, is a region in the left side of the brain known as the Superior Temporal Sulcus. This region achieved statistically significant sentence predictions in 11 out of the 14 people whose brains were scanned. Although that was the most accurate region, several other regions, broadly distributed across the brain, also produced significantly accurate sentence predictions. NeuroscienceNews.com image is credited to Andrew Anderson/University of Rochester. The researchers said the study opens a new set of questions toward understanding how meaning is represented in the brain. “Not now, not next year, but this kind of research may eventually help individuals who have problems with producing language, including those who suffer from traumatic brain injuries or stroke,” said Anderson. Funding: The Intelligence Advanced Research Projects Activity and the National Science Foundation supported the research. Image Source: This NeuroscienceNews.com images are credited to Andrew Anderson/University of Rochester. University of Rochester. “This Is Your Brain On Sentences.” NeuroscienceNews. NeuroscienceNews, 15 August 2016. University of Rochester. “This Is Your Brain On Sentences.” http://neurosciencenews.com/sentence-pattern-word-neuroscience-4839/ (accessed August 15, 2016). We introduce an approach that predicts neural representations of word meanings contained in sentences then superposes these to predict neural representations of new sentences. A neurobiological semantic model based on sensory, motor, social, emotional, and cognitive attributes was used as a foundation to define semantic content. Previous studies have predominantly predicted neural patterns for isolated words, using models that lack neurobiological interpretation. Fourteen participants read 240 sentences describing everyday situations while undergoing fMRI. To connect sentence-level fMRI activation patterns to the word-level semantic model, we devised methods to decompose the fMRI data into individual words. Activation patterns associated with each attribute in the model were then estimated using multiple-regression. This enabled synthesis of activation patterns for trained and new words, which were subsequently averaged to predict new sentences. Region-of-interest analyses revealed that prediction accuracy was highest using voxels in the left temporal and inferior parietal cortex, although a broad range of regions returned statistically significant results, showing that semantic information is widely distributed across the brain. The results show how a neurobiologically motivated semantic model can decompose sentence-level fMRI data into activation features for component words, which can be recombined to predict activation patterns for new sentences.